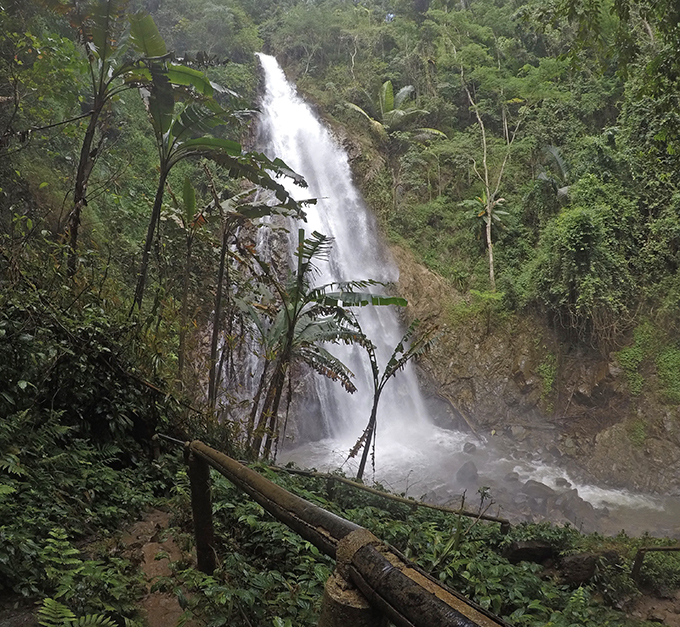 The Khun Korn Waterfall is the highest waterfall in Chiang Rai, Thailand. 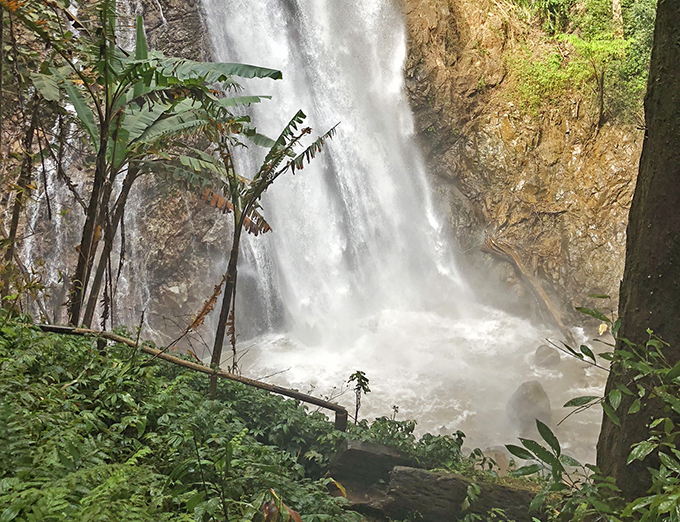 This powerful waterfall sits 229 ft high and amongst a lush, green forest. It is a MUST for any waterfall chaser during your visit to Chiang Rai. 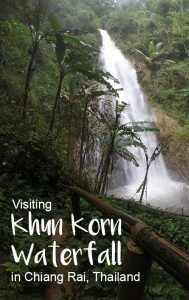 The Khun Korn Waterfall is located about 28 km (17 mi) from Chiang Rai. It is best accessible by renting a motorbike and driving. You can reach the waterfall by taking Highway 1211 from Chiang Rai City for 18 km, then turn right on Routh 1208 and continue for another 12 km. You can also drive on Highway 1 for about 15 km, then turn right on Route 1208 and continue for 17 km. You can also hire a songthaew if you prefer not to drive yourself. (This is the method I chose) It cost me 600 Baht for my driver to drive to the waterfall, wait there, and then drive me back to the city. The hike from the car park to the falls is about 1.5km and would be classified as moderately strenuous. 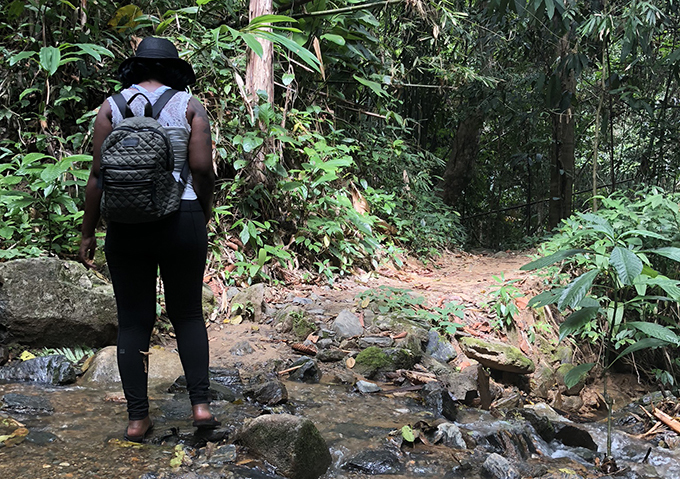 The trek towards the falls is mostly uphill and crosses through a few small streams. The path is easy to follow so there is no reason to worry about getting lost. It takes about 30 minutes to reach the top of Khun Korn from the car park. Next, relax in the cool waters when you reach the waterfall! The water is about waste deep so swimming isn’t much of an option. If you’re feeling brave, you can also journey through the falls to a small cave located behind the cascade. There is a small pool at the base of the Khun Korn Waterfall that is perfect for cooling off after the hike. You can also swim behind the falls themselves to a hidden viewing area. It’s impossible not to get soaked when you arrive at the beginning of the falls. The misty spray off will find you as soon as you start the descent down the steps to the base of the falls. There aren’t any vendors located at the falls or the car park so if you want any food or drink, you will have to bring it with you. I did see a few signs during the trail which read ‘no food or drink’ but you will definitely want some water and a small snack. Just make sure not to leave your trash! Mosquitos, along with all their other biting and stinging friends, are all over the trail. Make sure to bring bug spray! 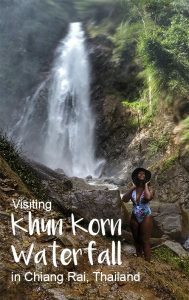 I had a great time hiking and experiencing Chiang Rai’s Khun Korn Waterfall. Something about listening to the sounds of a waterfall always soothes me. The best part was that I only saw a handful of other people while I was there and they were leaving! It is definitely worth getting out of the city and off the beaten path for a bit.